For maximum performance in your Gen 5 LT stroker engine, choose a camshaft that was designed specifically for stroker LT engines. Cam Motion's line of stroker camshafts are optimized to help your build achieve its full potential. Click on any camshaft to see more information on that particular grind. If you don't see exactly what you want, just give us a call and we will make it for your at no extra cost in most cases. 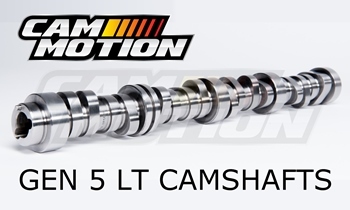 Cam Motion’s Gen 5 LT camshafts are optimized for superior performance, these cams utilize our renowned smooth, quiet and powerful cam lobes that are known throughout the LS community for quiet valve-train operation and maximum upper RPM stability. Cam Motion Gen 5 LT Camshafts are 5150 steel alloy. All Cam Motion Gen 5 LT cams are equipped with our .295" tall fuel lobe (commonly referred to as the "33% increase lobe"). This higher lift fuel lobe will help your direct injection mechanical fuel pump deliver the increased fuel volume your vehicle needs for high performance use.